Grace Roots Blog: We Live in the New, Not the Old! We Live in the New, Not the Old! Israel was under the old covenant. They were promised something new. This new thing wouldn't be like the old, nor based on the old, but would be completely different... Brand new. 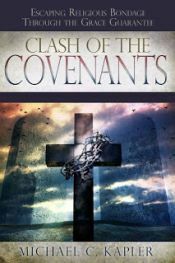 It would be a "better covenant," a "better hope," based upon "better promises" (see chapters 7-9 of Hebrews). They were even told in advance that what was promised in the new covenant would be for the Gentiles as well. So now we who are in this new covenant (whether Jew or Gentile) don't live according to anything that pertains to the old. We live according to what is new. We don't live according to the way Israel lived. We live according to what Israel was promised. Israel was promised something new! What's new in the New is that the Old Covenant laws have been "abolished" (Eph 2:15), made "obsolete" (Heb 8:13), and have been "wiped out," "taken out of the way" and "nailed to the cross" (Col 2:14), and it's all been replaced with new-creation Life in the Spirit! ("Life" is something that could never be brought about by law - see Gal 3:21). What's new in the New is that there is no longer any self-effort involved in trying to keep laws, but in place of the law is the Life of the Spirit of Christ in us, who produces the fruit of the Spirit - which again is something law could never do! The Old Covenant law was never God's will. "Behold, I have come to do Your will, O God," Jesus is quoted as saying in Hebrews 10:9. The verse continues, "He takes away the first that He may establish the second." So today, not only are we not under God's law, but it is the very thing that had to be done away with - "abolished" - in order for this new life in Him to be possible. It's not that there are no longer Jews and that there are no longer Gentiles, but anyone who is in this "one new man" (see below) is neither Jew nor Gentile. We (Jew and Gentile believer alike) have been grafted into Jesus, with the law having been "wiped out," "taken out of the way" and "nailed to the cross." Hey there Aussie John! Great to hear from you... hope you've been well!